The museum has information boards relating the history of events leading up to the Battle as well as details of the battle as well as a few artefacts and items of interest including a list of the names of the Trekkers that took part in the Battle. There is also a small auditorium where visitors can watch an excellent 45min video relating the story of the Trek and the Battle which can be viewed at no charge. 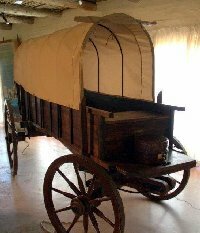 The wagon in the museum is an 80% scale replica of the Trekker Wagon,or 'Kakebeenwa'. The design of the 'Kakebeenwa' was the result of years of trekking in the eastern cape. Not too heavy that it needed a large team of oxen, simple enough for construction in areas where resources were limited, a rear axle that could easily be removed by removing two large pins so that a tree branch could be fastened underneath to stop the wagon rolling away when going down steep gradients, and with its large wheels it could negotiate rocky ground. The big disadvantage was the height which tended to make it top heavy. Hence the reason for the trekkers keeping to high, hard, ground when travelling. Designed by Coert Steynberg at the request of the Blood River Monument Centenary Committee, the monument was only completed in 1939, but the unveiling had to wait until 1947 because of the Second World War. The monument is constructed from raw granite and was initiall placed over the stone cairn in centre of the laager and had a window inside that allowed light to illuminate the rock cairn. It was moved to its current position in 1971 when the laager was erected." 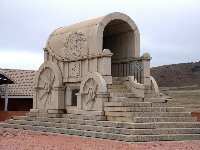 The wagon is symbolically seen as the home, fortress and church of the Voortrekkers"
Constructed in the shape of a pyramid using local stone the beacon was erected during the 1938 Voortrekker Centenary Commemorations. 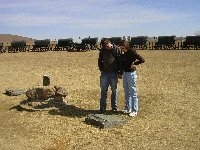 To the east of the beacon, embedded in a concrete slab are the tracks of the "Johann van der Merwe", a wagon specially built for the commemoration which took part in a symbolic ox wagon trek during that year. To the north of this position, also embedded in concrete, are the tracks of the "FAK Natalia" wagon that took part inthe 150th Commemoration in 1988. Erected on 16th December 1866 when some 40 odd wagons gathered here to commeomorate the Battle. Each person present placed a stone on the cairn in memory of the event. Sadly most of the stones have now gone. 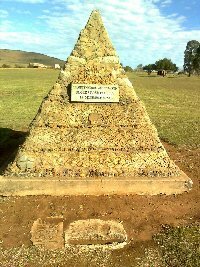 Present at the ceremony were several of the Voortrekkers and Zulus that took part.On either side of the cairn are two large bronze plaques with words of the convenant made between the Voortrekkers and their God are depicted. Erected and unveiled on 16th December 1971. The wagons are construct from wrought iron and are bronzed. The laager is arranged as closely as possible to what is believed to be that of the original laager. Those wagons left open are for the ammunition and thosed placed behind the cannons so that they can be quickly moved to allow the horsemen to enter or leave quickly. 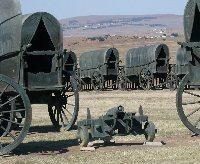 The pallisades or "fighting gates" fixed between the wagons were to keep the Zulus out and in this case are made of wattle. Here, in this laager, if you let your imagination loose you will feel the tension of the eary night in the mist as the Zulu Army moved in around the laager, the restless oxen and horses enclosed in the laager, the men waiting for the attack. Then with the dawn your senses will be unleashed as the Zulus charged the wagons, the thunder of the gunfire the cries of the attackers and the rattle of spear on rawhide shield. Only here can you experience such an emmotion! This laager, or "circle of wagons" is considered unique in the world even in countries where similar migrations took place. Andries Pretorius brought with him a 3 pdr brass ships cannon which he had had mounted on the front axle and undercarrige of a wagon. It is alleged that the cannon was placed on the eastern side of the laager in order to enable it to fire across the river. It is also said that it was this cannon that he used to fire on the Zulu Princes and senior regiments prompting them to join the battle. Strangely enough there is some dispute over the number of cannons present during the battle. 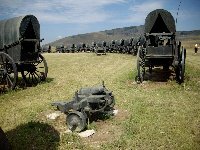 We are aware that home made cannon "Ou Grietjie" mounted on an old plough chassis and the brass cannon were present but there are also several references to a "Groot" (big) cannon named the "orphan" but there is no official record giving its size. 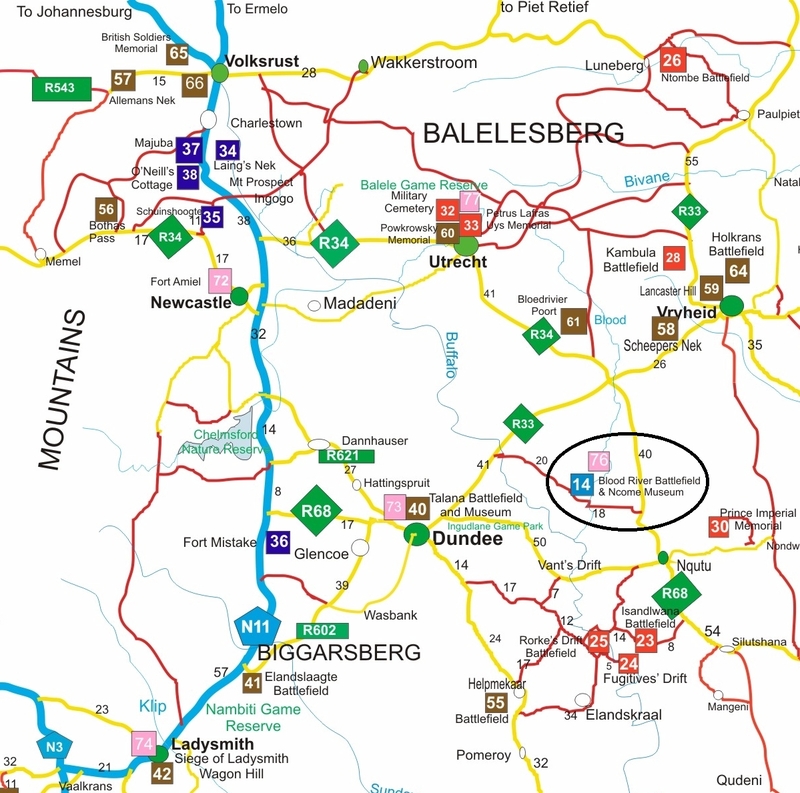 "Grietjie" was placed on the northern opening where the horseman could leave and the "Groot" cannon on the west. The original "Ou Grietjie" is in the Voortrekker Monument museum in Pretoria.